American people. These terrorists believed that if their plan would work, America would crumble - but they were wrong. Their terrorist plan may have worked. All of their calculation of time and place may have succeeded, but they made one grave error - they underestimated the American people. Because through all the death and horror and devastation, through all the grief and suffering, through all the loss, we have become not weaker, but stronger. It was Ralph Waldo Emerson who said, "Our greatest glory consists in never falling, but in rising every time we fall". And the real strength of America is not in our possession, but in our people - we the people - and our faith in Almighty God. As a nation we have been blessed so much by God. And even though some are doing their best to push God out of our country, miraculously, thankfully, He is still here with us. After the terrorist attacks some asked the question, "Where was God? Why didn't He stop the attacks? "That's a question no one can answer, but we do know this - God was there. As the passengers on those planes waited, they prayed. Some called their loved ones and prayed. Some prayed with telephone operators. And those who spoke with these passengers talk still today of the peaceful assurance as they spoke - a calm only God could give. After the first plane hit that North Tower, there were thousands of people who were trapped with no way to escape. There are reports of one man on the 105th floor of Tower One, going from office to office praying with people, with groups of people, giving them the assurance of God's love, His mercy, His forgiveness through Christ. There are amazing stories of people who could have left but, instead, voluntarily stayed with the injured and those who could not get down the stairs. People who knew that by staying - they would never survive. Where did these people find the unbelievable courage to stay? From Almighty God. One firefighter who had just finished his final training the day before, his first assignment was the 9/11 fires. He remembered, as the bus transported him and fifty other firefighters to that horrible scene, a chaplain was on the bus praying. That Fire Department chaplain was killed outside the buildings, hit by falling debris. He had been kneeling in the rubble and chaos, giving the last rites to a dying firefighter. And the firefighters who bravely stormed into those buildings literally melting from the intense heat of the jet fuel pouring down those stairwells, these brave workers went right into the very face of death with nothing more in mind than to help those in need. There are accounts of people who met these firefighters in those stairwells. Their faces, their determination, their bravery. 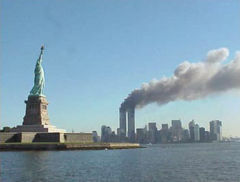 Oh yes, on 9/11, God was there. To comfort, and console, to hold His dear children oh so tight, to wrap them up in His loving arms, and take them home. And that same God is here with us today. To comfort you if you are hurting, to give us in the midst of sorrow, a peace in our hearts that only God can give. He is here with us today, to mourn with us in the loss of so many brave Americans - we the people.